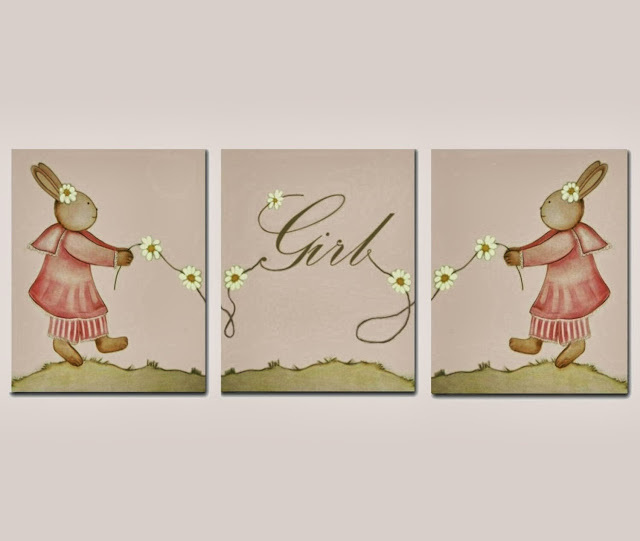 Those adorable little bunnies with cute coral dresses, is a beloved and tender theme of my artwork for a cottage shabby nursery room! (¸.•´ (¸.•´✻Once upon a time, on a beautiful spring day, two little Bunny Girls, were walking and singing on a sunny day at the french country picking up daisies. This beautiful SET OF THREE ( each 8'' x 10'') Art Prints, is a reproduction of my Original hand painted Artwork for baby nursery kids room. If have any questions, feel free to contact me, it's always my pleasure.